I'm finally back to test the tools of our ancestors after taking a break to finish up the PhD process. As it turns out, the final push to finish the degree takes up a few minutes out of one's day...who would have thought. All that is done now and I have a chance to play again, so lets go! 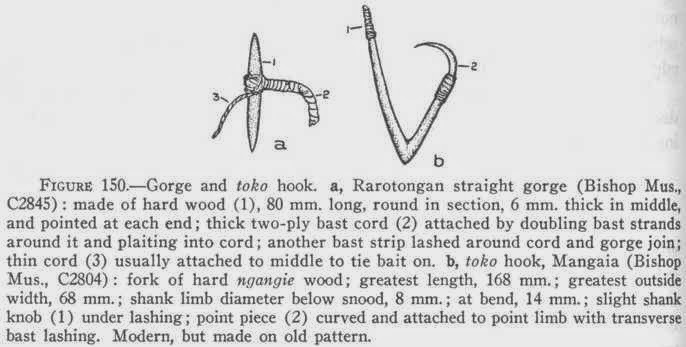 I first saw fishing gorges in a book by Te Rangi Hiroa (1930) where he illustrated small pointed sections of bone used for fishing by Samoan Islanders. I had been curious about this fishing technique for a while and finally gave it a go for myself. Double wooden fish gorge from the Samoan Islands described by Te Rangi Hiroa. Gorge hook illustrated by Te Rangi Hiroa from Rarotonga, Cook Islands. 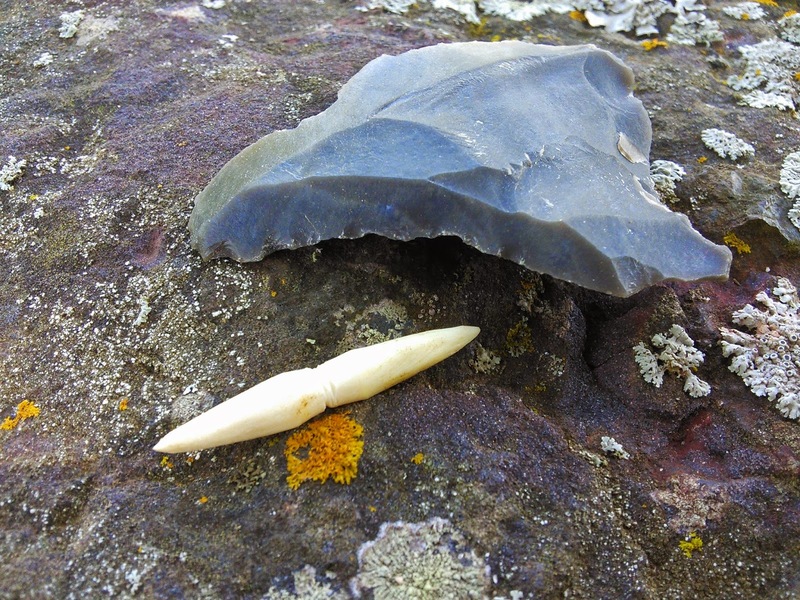 I made an antler gorge with stone tools and a sandstone abraider to the general specifications found in the archaeological record, about 3cm long by 3-4mm wide with a small notch to hold the line. I baited the line with a section of worm (after my dog pilfered the steak chunks i had also brought). The line was cast into shallow water and slowly pulled about 3 feet under the surface. So, things worked eventually after a little trial and error. The antler gorge ended up being too thick in diameter for the species of fish I was after. The length and diameter of this tool must be tailored to the size of the target prey. Upon realizing that the antler gorge was slightly too thick for the bluegills that were interested in the bait I simply cut a small twig from a cedar tree and made another gorge. After I made this adjustment the game was all over, fish after fish took the bait and were easily pulled from the water. 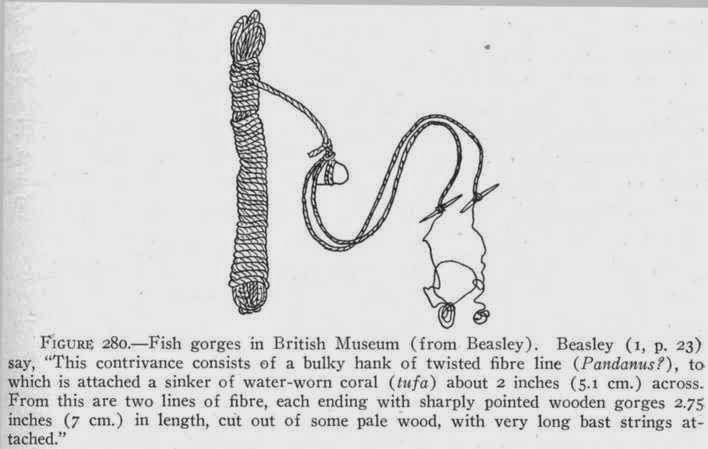 While more fish escape the gorge in comparison to a barbed hook, the method works very well given a little time and adjustment for fish species. As a cost/benefit trade off though, I made the twig gorge in about 3 minutes and caught 4 fish in 30 minutes. 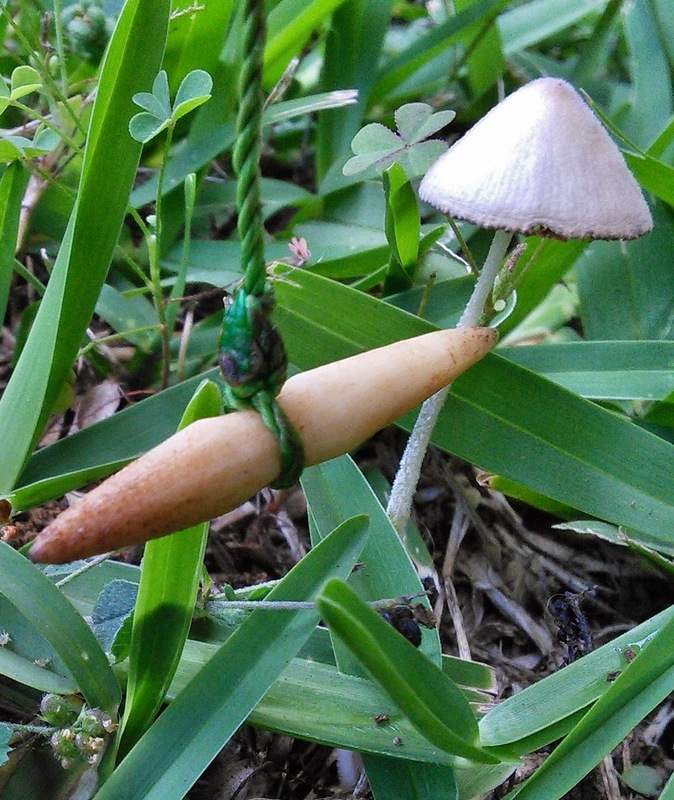 Needless to say, I caught a healthy meal in less time than it would take me to fashion a barbed bone hook. So there we have it! Fishing gorges work really well with a little bit of tweaking for target species. Give it a try sometime, and remember to keep the baited hook parallel to the line so it goes into the mouth straight at first. Give the fish a few seconds to chomp it back into the throat and then simply pull the little meal out of the water. 2013 4000 Years of Migration and Cultural Exchange: The Archaeology of the Batanes Islands, Northern Phillipines. Terra Australis 40. Australian National University Press, Canberra, Australia. Te Rangi Hiroa (Dr. P. H. Buck). 1930 Samoan Material Culture. Bishop Museum, Honolulu. Original Flying Lure Soft Plastic Fishing Bait & Hooks - We provide the Best Fishing Lures for Freshwater Bass or Salt Water Fish. The Flying Lure by Alex Langer is Amazing and will Trigger multiple Strikes on Each Cast. The key to this lure is the amount of weight used to create just the right fall time that looks, acts, and swim like real Bait. One of the Best Fishing Lures Ever Sold. Fishing Lures For Sale.